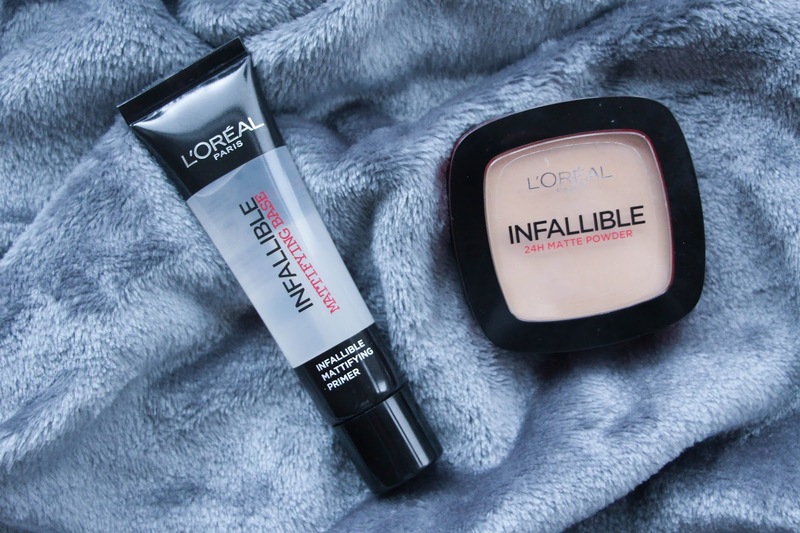 The Infallible 24H Stay Foundation by L’oreal has been my favourite foundation for months now. I have bought different ones afterwards and I still go back to it. So, with that, I decided to buy the other two products from this range – the primer and the powder – and give it a go. Here is what I think about them all! Fist of all, I have to say that I am not a fan of completely matte face and both of these two products are known to help achieve a matte finish. Still, because I love the foundation so, so much, I really wanted to try them. The primer comes in a very elegant and good sized packaging that gives you 45 gr of product. I think that is quite a good amount for the price (Boots, £7,99). When applying it, it does feel quite greasy and that is something I don’t particullarly like. Although when leaving it to dry for a couple of minutes before stepping up to applying your foundation, it dries quite easily not leaving any oiliness on your skin. It does cover most of your pores and the blending process of your foundation goes much smoother than if you weren’t applying any primer. Because I am not a fan of a completely matte skin, I use this product in the problematic areas of my face that tend to get oily throughout the day and that is my “T” zone and also my chin. While using this primer I do notice that those areas don’t get as oily and the foundation lasts much longer. So I must say that I really like this product but it is not one of them that I would use everyday as in a daily basis I like a glowy skin and so I prefer the L’oreal Lumi Magique Primer! Now the powder it is actually something I have been wearing everyday , specially on my “T” zone. When you powder your foundation with L’oreal Infallible 24H Matte Powder (£4.99) you get extra coverage as this is not a translucent powder. It actually says that for even more coverage you can apply it wet but I never tried that way and I am not sure how it would work. I have been applying it on top of my foundation with a big powder brush and I absolutely love the finish! It feels like nothing on your skin but it gives you that little extra coverage and sets everything in place making it last a long period of time! It leaves a smooth texture to your skin and when touching there is absolutely no transfer at all. The packaging is also very cute and compact. There is no mirror or any of them annoying brushes that come with it and that is an extra point on my list! So, I have to say that for a person that is not actually a fan of matte finish, I have been using this powder like there is no tomorrow. To had the glow that I love the trick is just to apply a little extra of highlighter and I am ready to go! Have you ever tried any of these products? What are your thought about them? Let me know in the comments bellow.